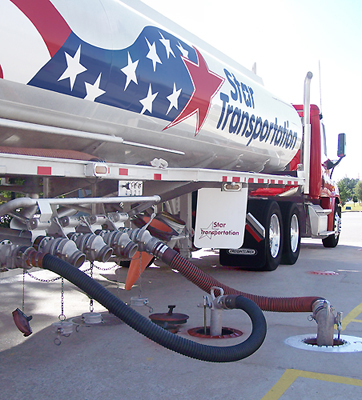 Star Transportation, LLC specializes in the transportation and delivery of products such as gasoline, diesel, aviation gas, jet fuel, ethanol, and oil. By teaming with Star Transportation and allowing us to manage your inventory you can be assured that your inventories remain within the parameters you set. By utilizing our fleet 24 / 7 / 365 you get all of the benefits of your own private fleet without the hassle or liability. In addition to inventory management services we offer same day deliveries, FTP or E-mail billing options and customized reporting services to meet your individualized needs. We can specialize any of our services to your specific needs and can easily adapt as your requirements change. Call us today so we can show you how Star Transportation, LLC can be of service to you.